This stumped me for the LONGEST time. So much so, that even if I ran out of bobbin thread near the end of a quilting line, I would still unpick the ENTIRE line so that I could start again. Ugh. Let’s avoid that craziness, shall we?! 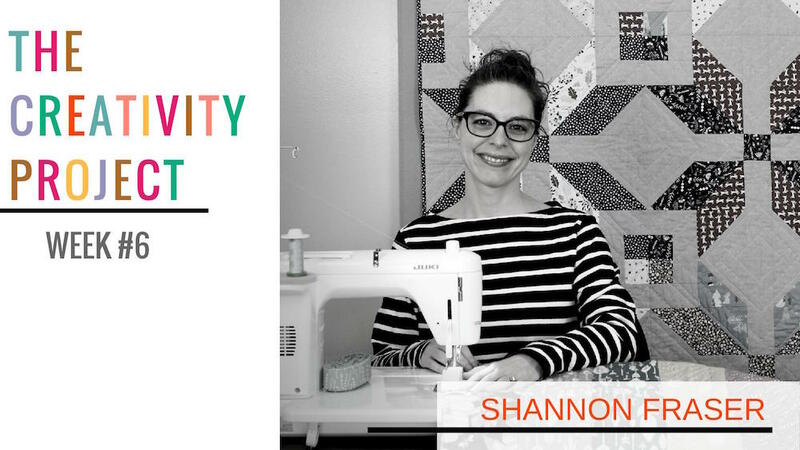 Until finally one day I was tackling a quilt that needed to have quilting that started and stopped within the design elements. Since I wanted to avoid back stitching for a more seamless look, I really needed to figure this out. I watched YouTube videos and read blog descriptions and it just wasn’t working for me. 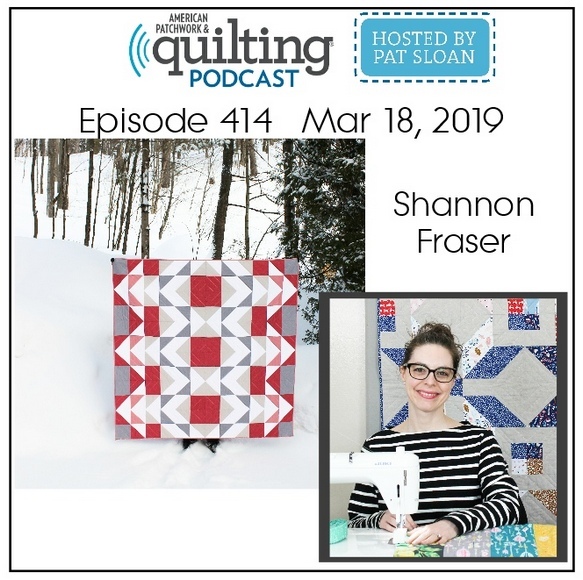 I finally had to use my “call a friend” card to figure it out – thank you Josée (who’s an amazing modern quilter, one of the first quilters I ever met in person and someone I just adore) for being so helpful and taking my panicked call!! I’ve come a long way since this first thread burying project. And these are the tips I’ve learned along the way. 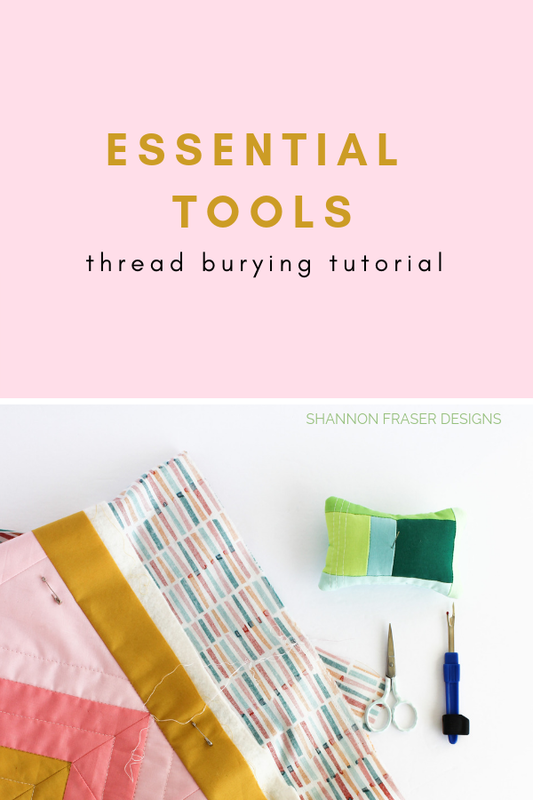 First up are the tools you’ll need to get the thread burying job done! 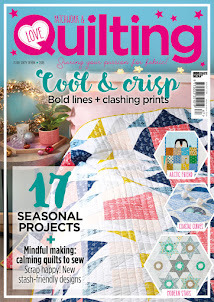 And, of course, your quilty project! NOTE - there's a handy video at the end of this post that helps walk you through the steps if you prefer a more visual explanation! 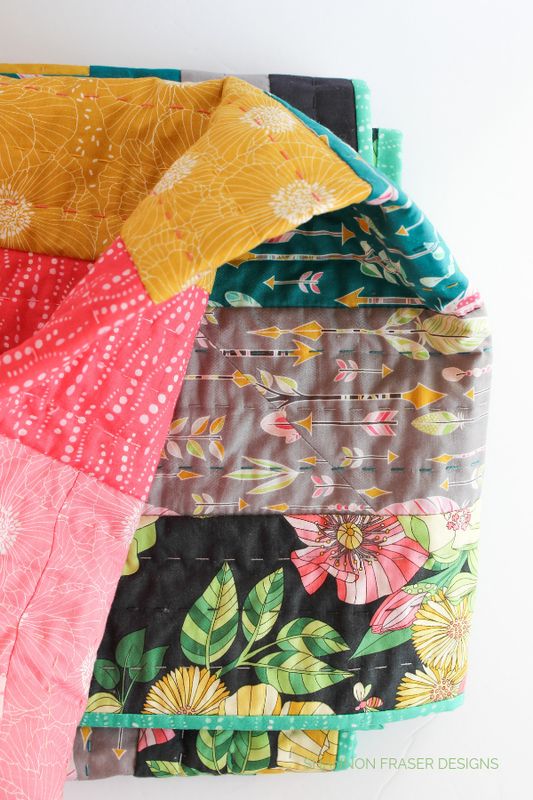 To begin, you’ll want to start off with nice long tails in both your top and bobbin thread. 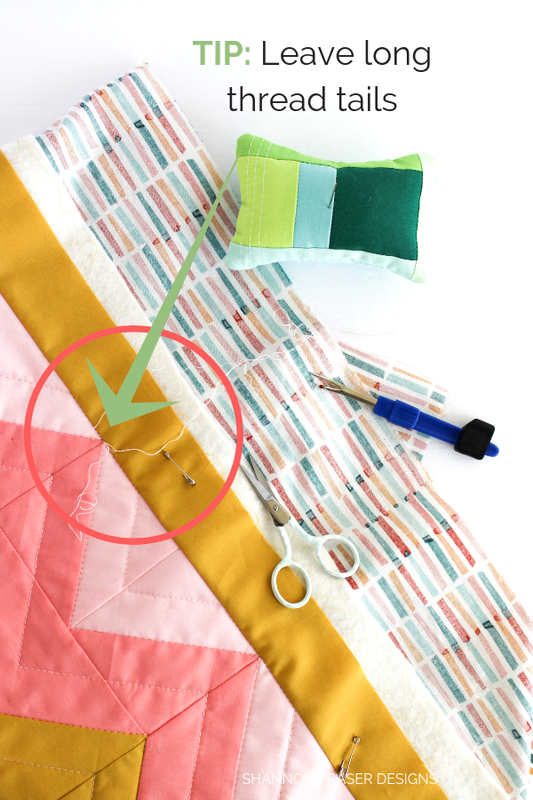 This will make it easier for you to pull the bobbin thread to the top of your quilt. 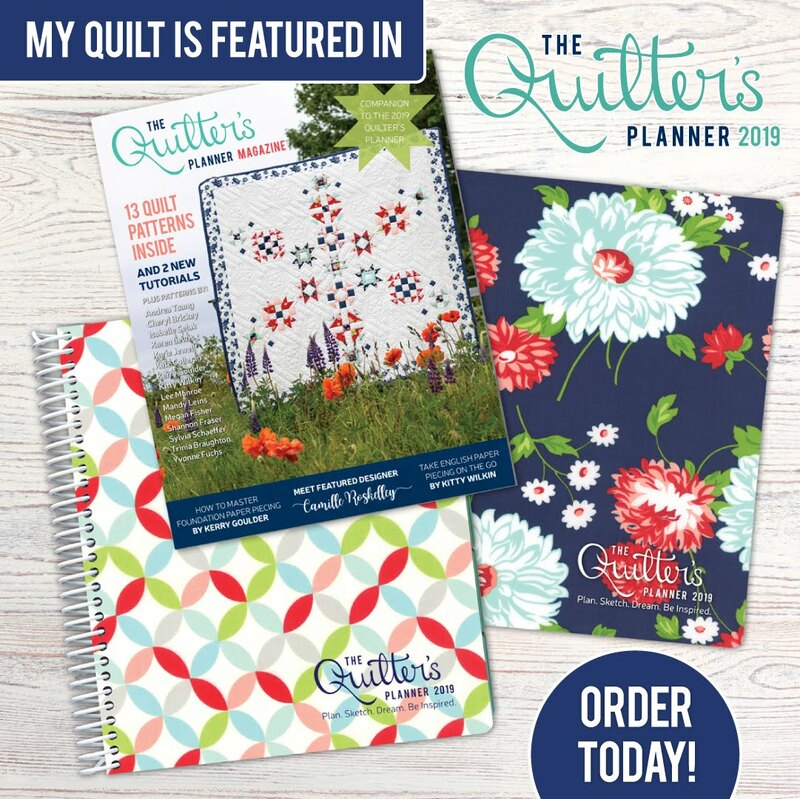 Drop your needle where you want your quilting to start. 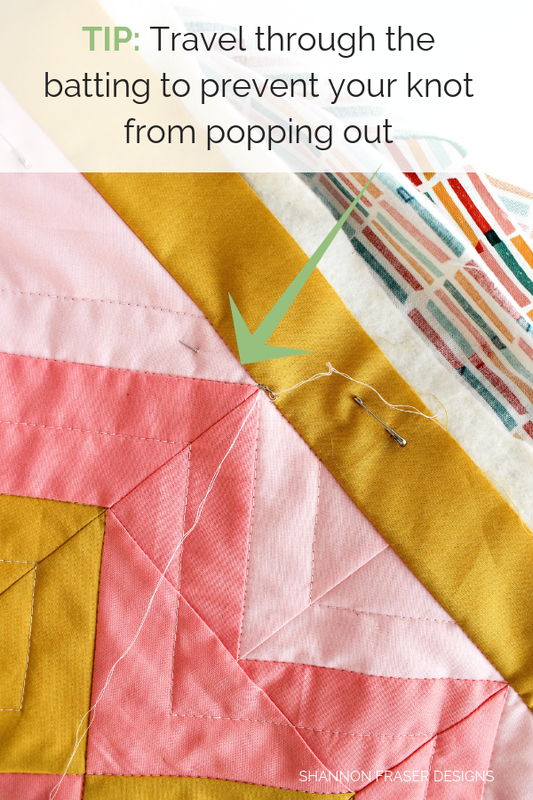 Pull the needle back up while holding onto your top thread. This will help you pull that bobbin thread through the hole and to the top of your quilt. Drop your needle directly back into the hole you initially created. 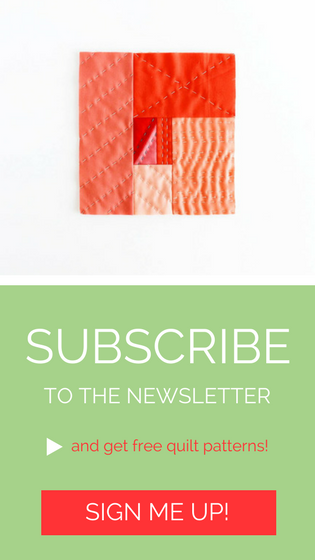 Reduce your stitch length to zero and take a few stitches in place. This will essentially knot your threads. But, I’ve found this can lead to small nests on the back of my quilt, so proceed with caution with this technique. 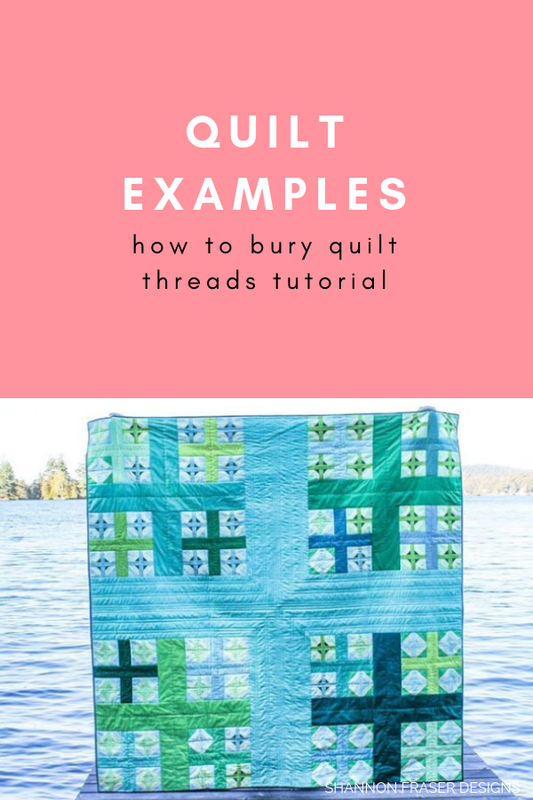 And/ or, you can just start quilting by holding onto the threads (so they don’t move on you) and come back to it after you’ve finished quilting to knot and bury it manually. I tend to do both. Which is probably overkill, but the last thing I want is for things not to be knotted properly and unravel on me later on. 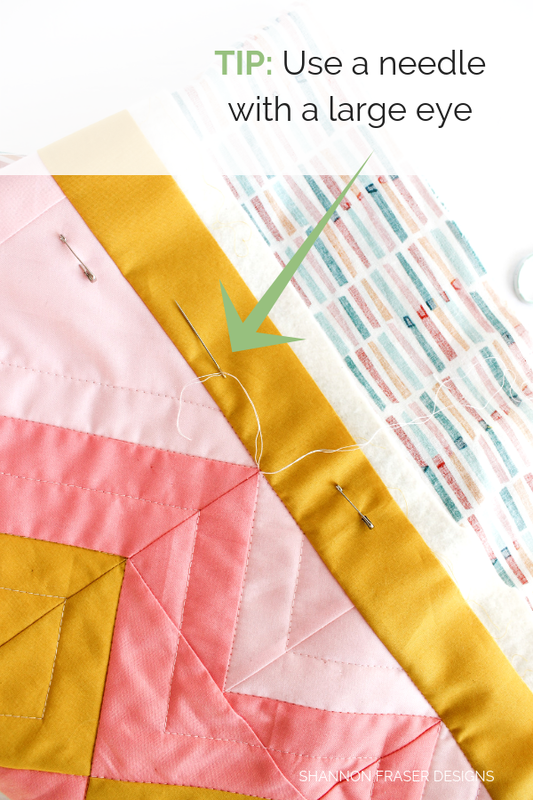 If you decide to reduce your stitch length, once knotted, remember to switch your stitch length back to your preferred quilting setting. I usually set mine to 3 on my Juki. 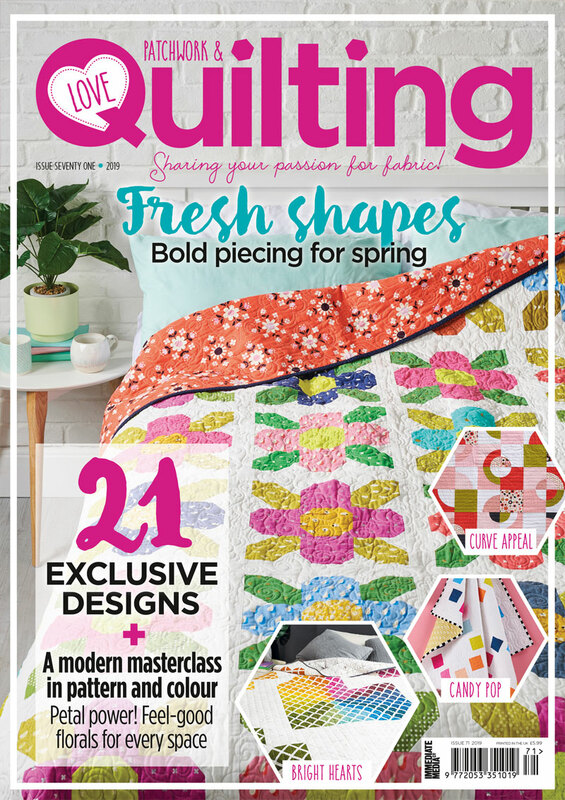 Now, quilt as you normally would. 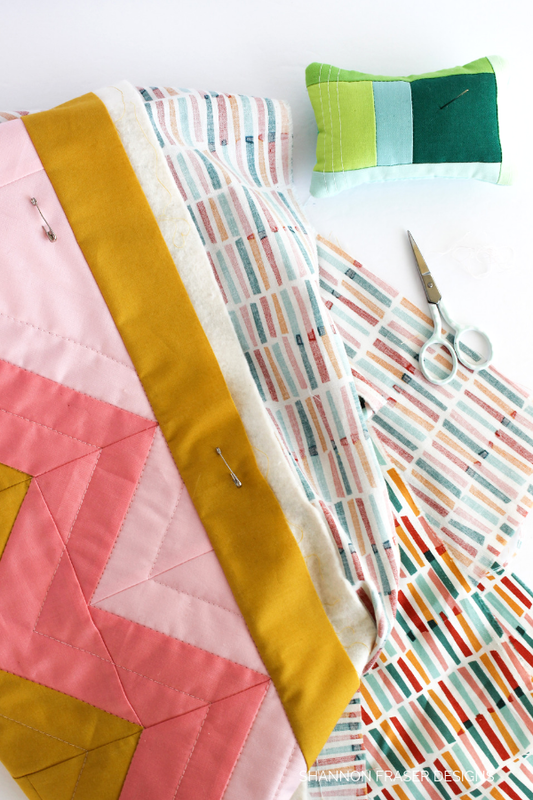 Once you’re done quilting, you’ll want to manually cut your threads. 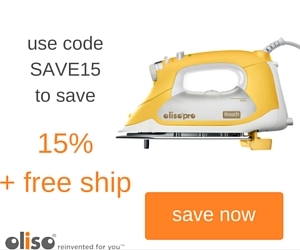 I say this because my Juki has auto thread cutting (which I adore), but it cuts them too short to be able to knot and bury the threads afterwards. So, avoid using that feature if you have it (trust me, I’ve learned the hard way). Raise your needle and pull both your top and bobbin thread so you have some length, then manually snip both threads. 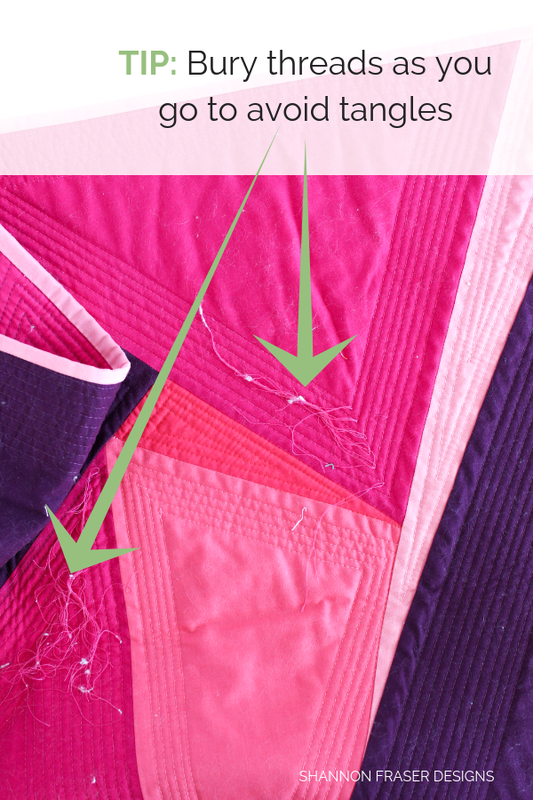 Move your quilt away from the machine and pull on that top thread to pop the bobbin thread loop to the top. I use the tip of my seam ripper or scissors to then pull that bobbin thread to the top. Now, knot that thread twice. Trim your two threads so they are equal lengths. This just makes it easier to thread the needle. Now, thread both threads through the needle. Poke the tip of the needle back into the hole your threads are coming out of and travel between the top and backing of your quilt, about an inch or so, before popping the needle back out the top. 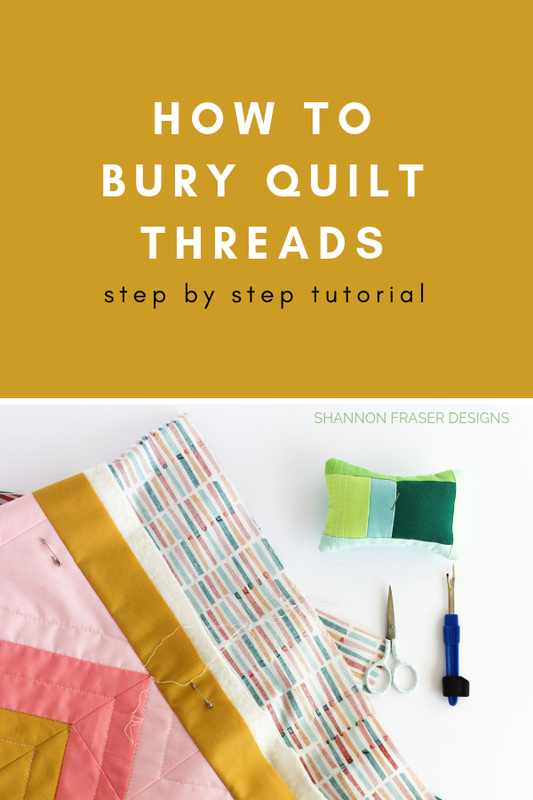 Pull gently on those threads to help pop that knot under the quilt top and snip the thread tails right near the quilt top. By pulling gently on the threads, once you snip them, they will disappear right back into the batting for a seamless finish. And, voila, you’ve buried your first thread. 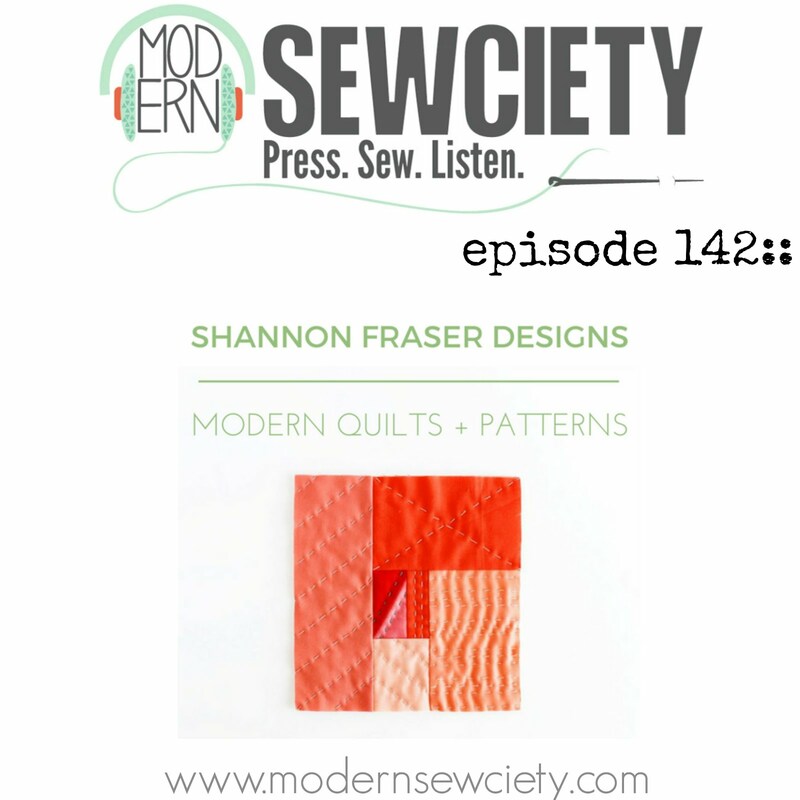 Repeat this exact same process with the thread tails you created at the start of the stitching line. 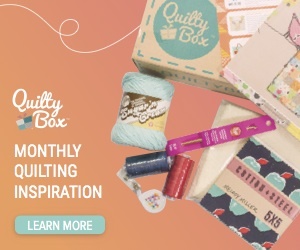 Now, you’re probably asking “well, what about when you run out of bobbin thread mid quilt line?”. Ah, yes, the pesky run out of bobbin thread mid quilting dilemma. 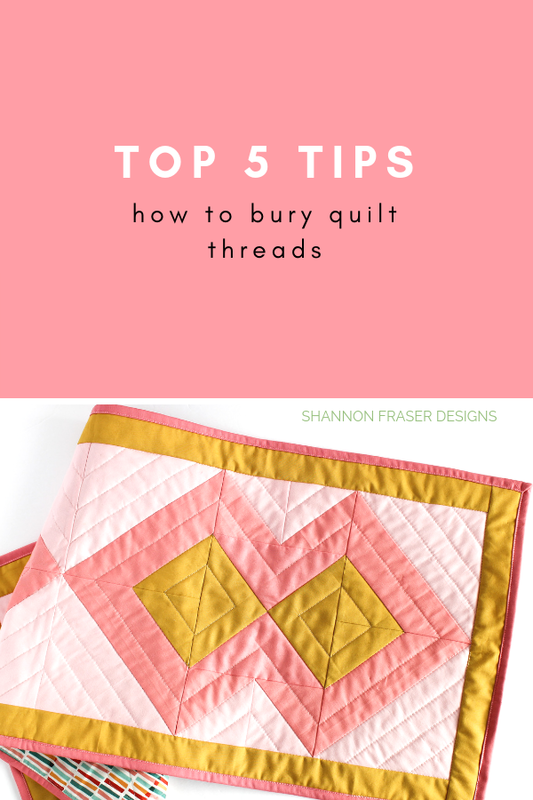 Unpick a few stitches until you have a long enough bobbin thread to pull to the front of the quilt and that’s long enough for you to be able to thread a needle with. And then just pop that bobbin thread to the front by pulling on the top thread. Trim both threads to the same length. Thread your needle with both threads. 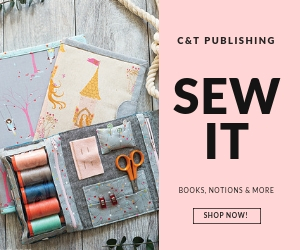 Pop your needle back in the stitch hole and travel through the batting about an inch before popping back out the top of the quilt. Pull gently on the threads and snip. Since this is a tough technique to explain in photos, I thought a video would be super helpful! I walk you through both of the scenarios described above so you can see it in action. I have now done my share of thread burying! 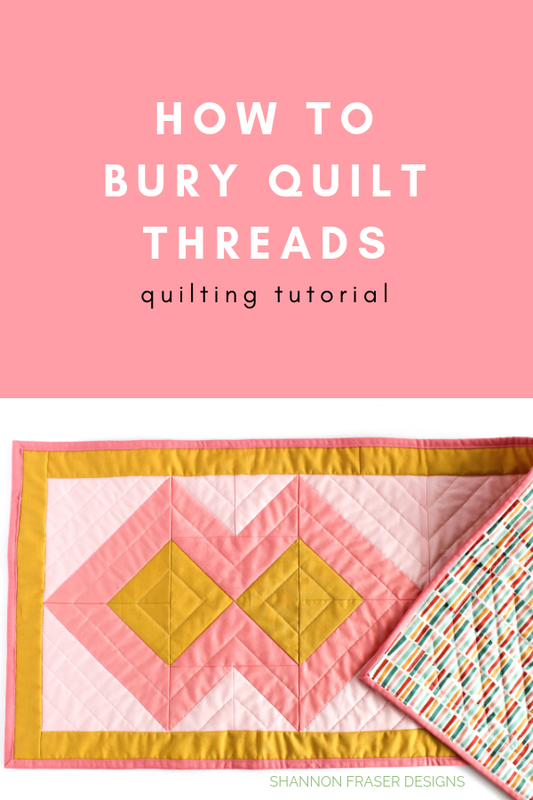 What I love is how clean and seamless the finished quilting looks when you bury your threads (as opposed to back stitching to secure your threads). 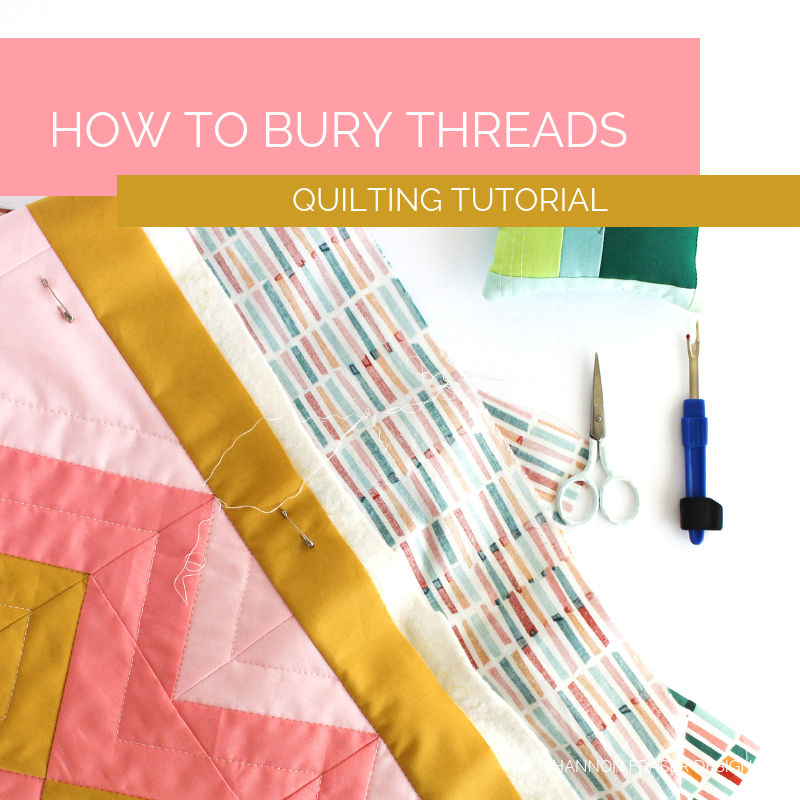 Here are some projects where knowing how to bury threads really came in handy. 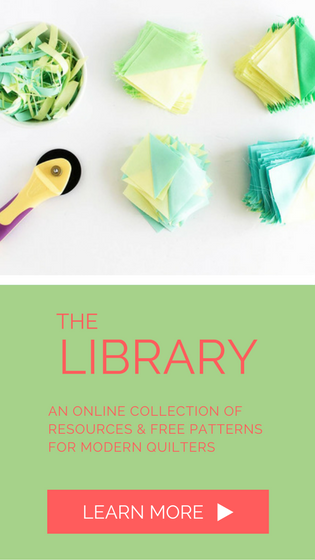 The Marble Reverberance Quilt is a great example where I wanted everything to be seamless. I not only stitched in the ditch, but also had some quilting in the center of each colour variation. Since this was being featured in Michael Miller Fabrics booth at Quilt Market, I definitely didn’t want any backstitching interfering with the design. Thread burying was essential to get that seamless look. 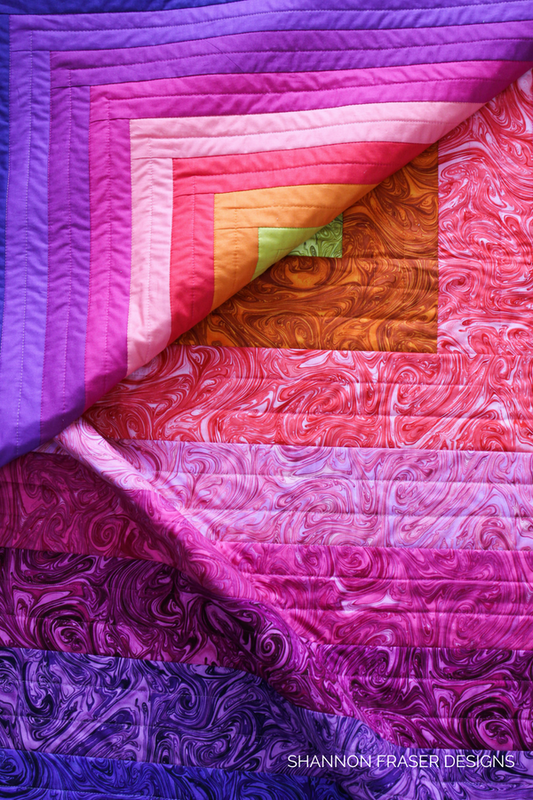 Similar to the Marble Reverberance Quilt, I really wanted everything to blend nicely on the original Reverberance Quilt so that the focus was on the quilt design. 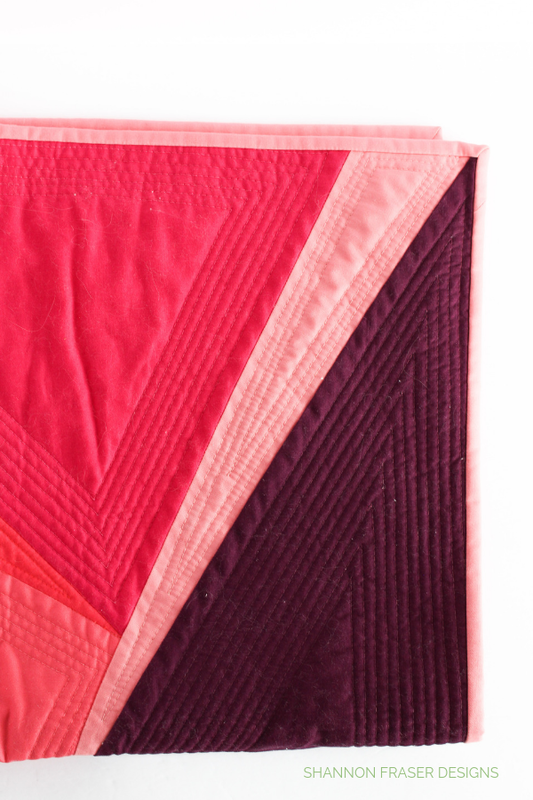 Although most of the visible stitching is hand quilted, I anchored the quilt by stitching in the ditch between each colour change. This was a labour of love! 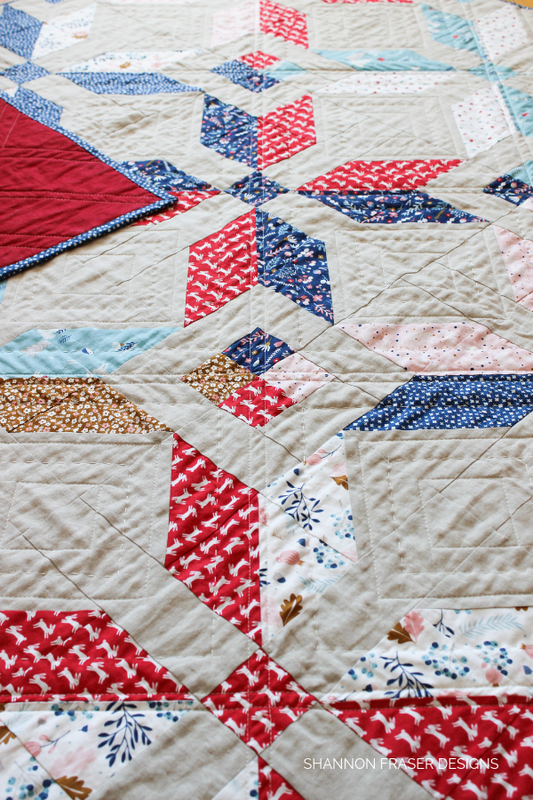 Not only did I hand quilt this pretty Winter Star quilt, but I also opted for quilting that would enhance the design of the quilt. Lots of thread burying on this one! I adore this table runner I recently shared. It entailed quite a bit of thread burying to mimic that diamond shape, but worth the extra effort! Remember when I mentioned using my “call a friend” card? Yup, this is the project I was calling about. 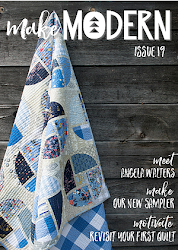 The Hundred and Eighty Degree quilt has been in the works since 2016. And I just finished burying the threads. Literally just! 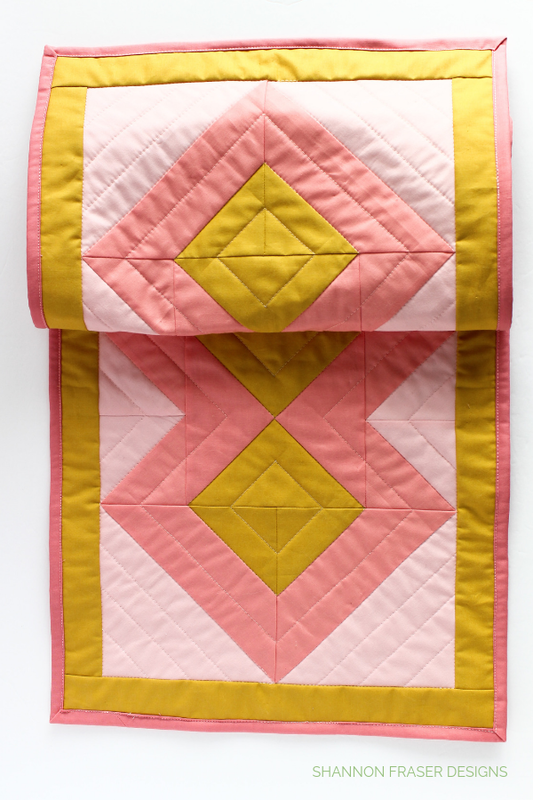 I learned a lot during this project and lots of the tips I picked up are lessons learned from this quilt. But the lessons, effort and perseverance were well worth it! I’ve still got a sleeve to attach and then I’ll be sure to share her with you. First and foremost – bury as you go! I was given this sage advice by Stephanie from Queen of Wands Studio and she, no doubt, was speaking from experience. I didn’t listen the first time around and wound up with these masses of tangled threads on my Hundred and Eighty Degrees quilt. Ugh. If the thought of burying threads was discouraging enough, seeing that tangled mess was enough to send me running for the hills. So, learn from my pain and bury as you go. Make sure you leave a long enough tail. Trust me. I speak from experience here. Short threads = pain. If your threads are too short, you’ll have a dickens of a time getting your needle threaded. So, leave a nice long tail. Use a large eye needle or have a needle threader on hand. This will help speed up the process and save your eyes along the way. 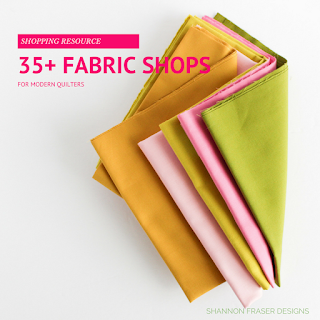 Have a pair of sharp snips handy. You don’t want your threads fraying as you try and thread your needle. The more you practice, the easier it gets! 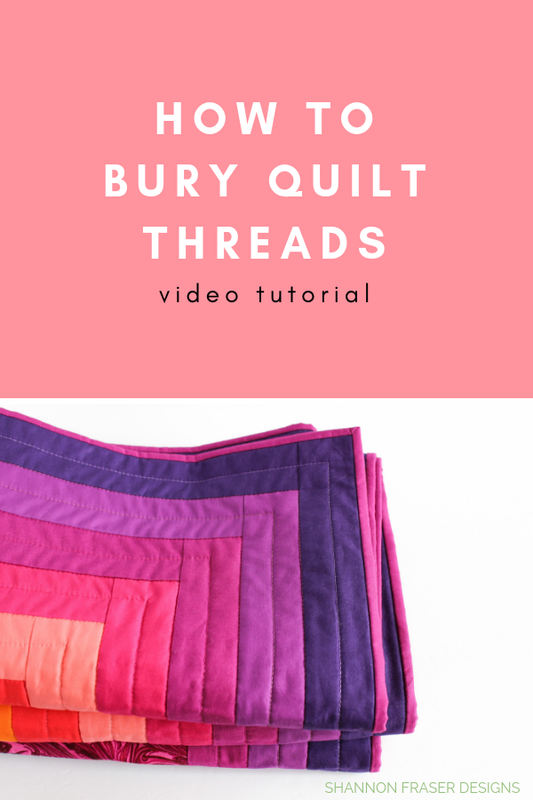 I know we all pick up different tricks along our quilt journey, so I’d love to hear your favourite thread burying tips in the comments! This is a great tutorial and very helpful tips. Long thread tails make it easier. I use self-threading needles. I also have those cheap non-prescription reading glasses handy to help with threading the needle. 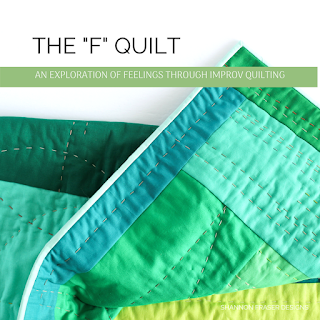 All said, this is my least favorite part of FMQ :-) I try to avoid it as much as possible by traveling to to the next area or to the edge of the quilt. So thrilled you found the tutorial helpful, Vasudha! I have heard of self-threading needles and really need to look into these more – thank you for the reminder! Self threading needles forever! Or you can fake your own with a small loop of thread tied through the eye of the needle (a loop about the size of a quarter or loonie). Then run your threads to be buried through the loop of thread. That is so good to know, Nicole! Thank you for the tip, I’ll definitely give it a go!